Facebook is known to be a gigantic social media network in the whole planet. Facebook being the world’s most used social networking website was launched in February 4 2004 by Mark Zuckerberg. It was first used by 4 of his friends and room mates. By origin it was used by Harvard University to connect students and it was quickly expanded to other schools. Later in 2006 the website was opened for common people of age 13 and above. Now there is barely a person on planet who haven’t heard about Facebook! So here are some fascinating facts about Facebook. Today, 150000 messages are send by Facebook users in every single minute. In every 15 minutes, 49 million posts are published in Facebook. There are over 350 million photo uploads a day. There are 1,00,000 friends requests in every 10 minutes. There are 7.5 million likes generated in every minute. Average user spends 20 minutes per day on Facebook. People spend about 31 million hours a day playing Facebook games. There are 1 billion enabled mobile apps on Facebook. 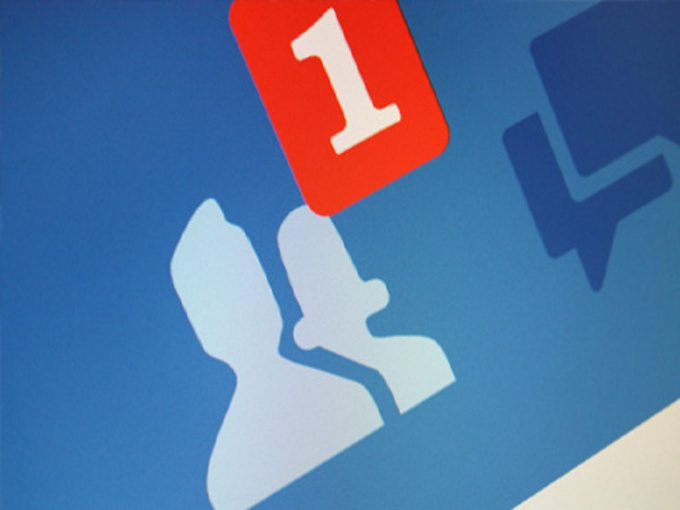 These are the most fascinating facts about Facebook. Facebook users have great differences when it comes to number of friends. An average user has 250 friends, i.e. half of all Facebook users have more than 250 friends and remaining half has less than 250 friends. 15% of Facebook users have more than 500 friends. 20% of users have 251-500 friends. 23% of users have 101-250 friends. 39% of adult Facebook users have 1-100 friends. Young users tend to have significantly larger number of friends than older users. This fact is totally related to Mark Zuckerberg – CEO of Facebook. Facebook got its color blue because Mark Zuckerbergs’ color blindness makes him find blue better than red and green. He suffer from red and green color blindness. He once said “Blue color is the richest color for me”. I am sure most of us have kept Facebook on our mobile phones without logging out from a very long time. There are more than 1.44 billion new Facebook users in every single month (which is just an approximate count). Another great fact is that 79 % of new users access Facebook from their mobile phones. 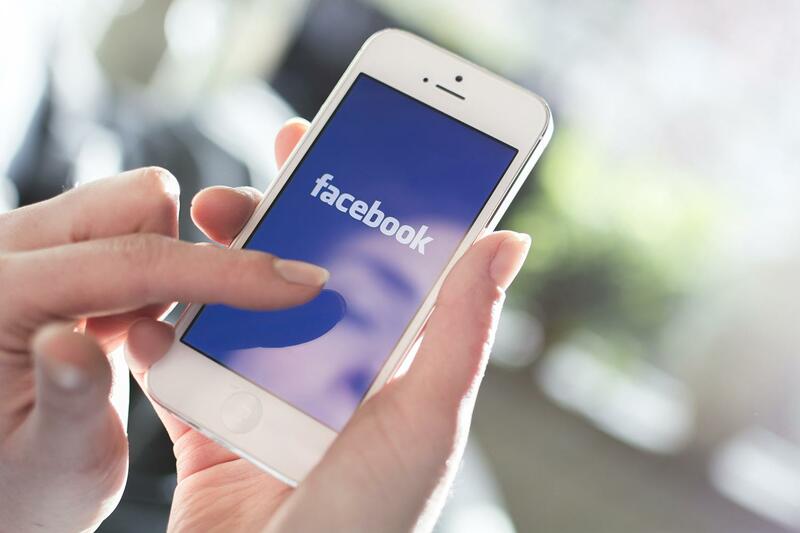 Smart phone users check Facebook 14 times a day. Just imagine, every person sitting 3.74 degrees apart uses Facebook. I wonder how they got such a value! But it is said that there 3.74 degrees of separation between two Facebook users on average. There are Facebook users in US which is more than the total number of citizens in United States who actually voted in recent elections. Imagine a country without Facebook. I am sure it’s very hard for us to imagine like that. Facebook’s headquarters is in California and it can be used from anywhere in the world except China. 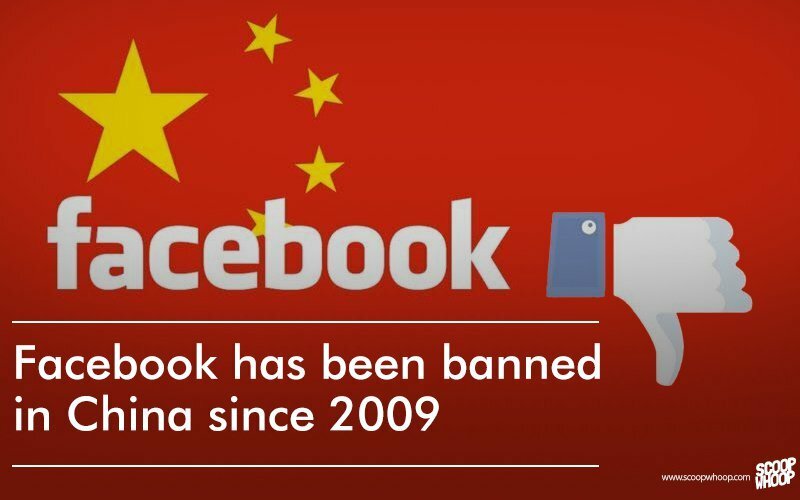 That is because Facebook, Twitter, YouTube etc are blocked by China since July 2009. But there are 95 million users in China who access Facebook through mobile devices, VPNs and other resources. Now that’s good to hear! Even though Facebook has many amazing facts, there are several negative consequences as well. 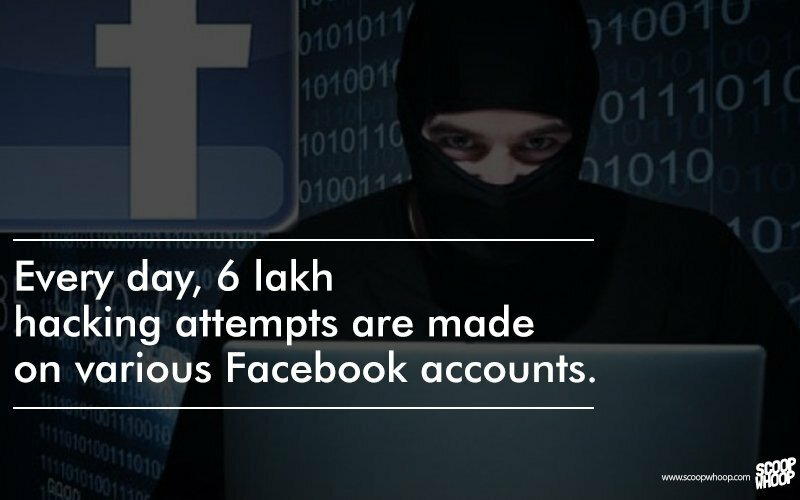 There are 600000 hacking attempts made in every single day on various Facebook accounts. And I’m sure most of us have had an experience of getting your account hacked. Isn’t it hard to believe? 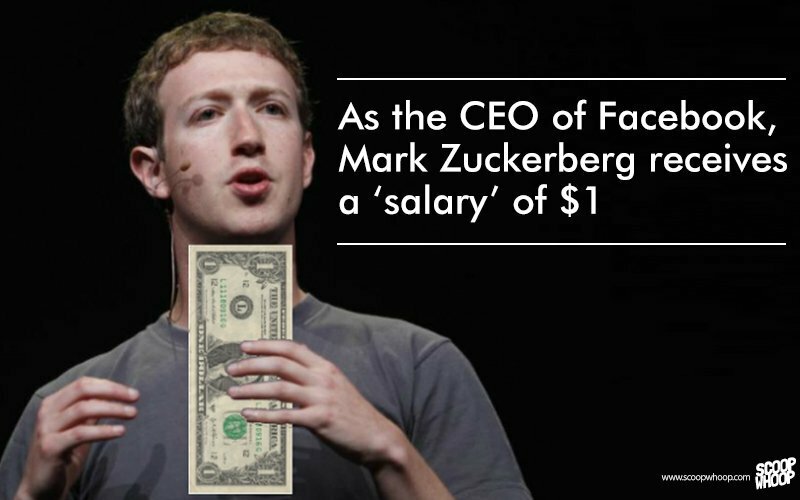 True or not, it is said that Mark Zuckerberg receives a salary of $1. Being the founder of Facebook, he has donated 1 billion dollars for charity which makes him the largest charity donor in United States. This fact may be something that most of you all haven’t heard about. 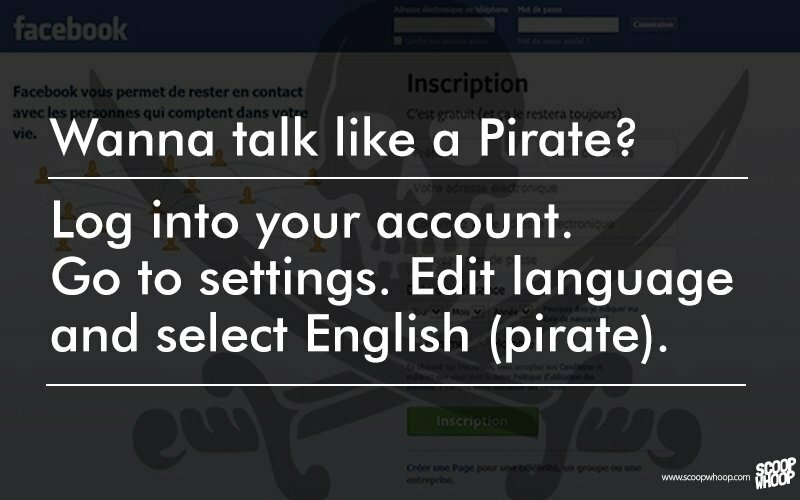 There is an option in Facebook if you want to talk like a Pirate. Once you are logged into your account, head to Settings>Language settings and select English (Pirate). It’s gonna be much more interesting to see your feed with “Home port”, “Captain’s Log” and “Bottle o’ messages”. And if you have had enough fun, go Abandon a Ship! Have you ever wondered if you could Block the CEO of Facebook – Mark Zuckerberg from your facebook account. Well, we must know that he isn’t gonna make any reasons for us to block him. So that’s what he did. He removed the Block option from his page. 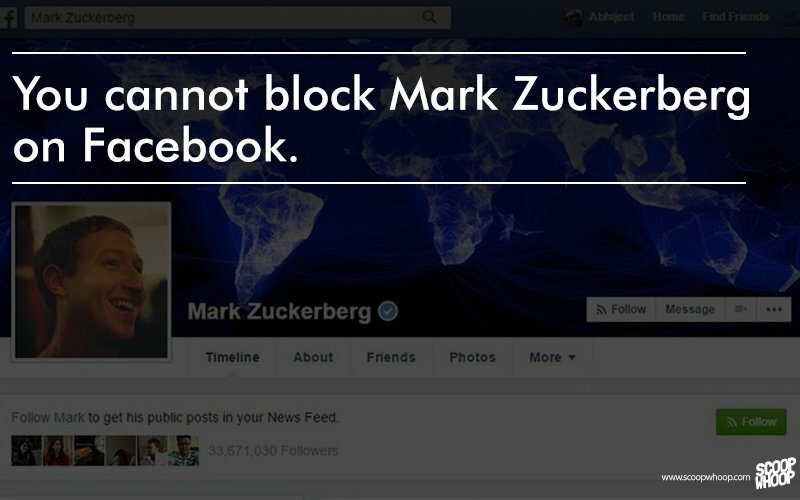 In simple words, we CANNOT BLOCK Mark Zuckerberg on Facebook! If I ask some of you, how many Facebook accounts do you have, few of them would definitely say ONE without hesitating but a very lot of them wouldn’t open their mouth to answer. That is simply because, they wouldn’t like to reveal that they own a fake account. 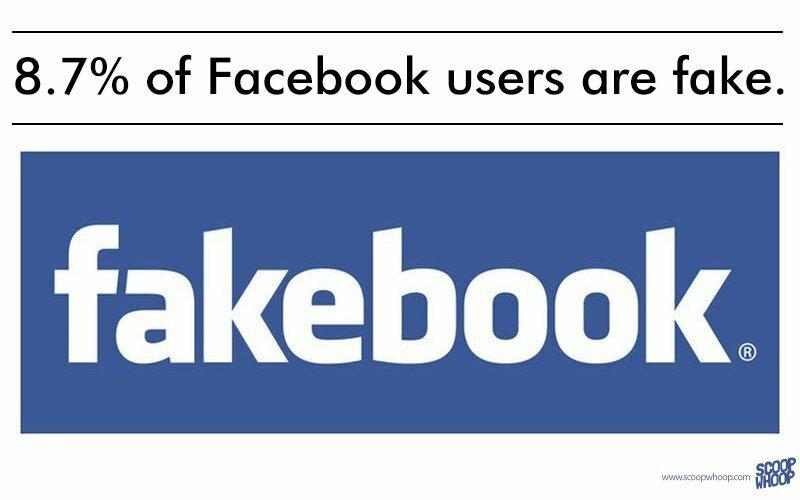 Being a matter of fact, out of the huge amount of Facebook accounts, 8.7% of Facebook users are FAKE ! Just imagine yourself saying 1000 people ‘AWSOMEd my photo’. How cool would that have been? 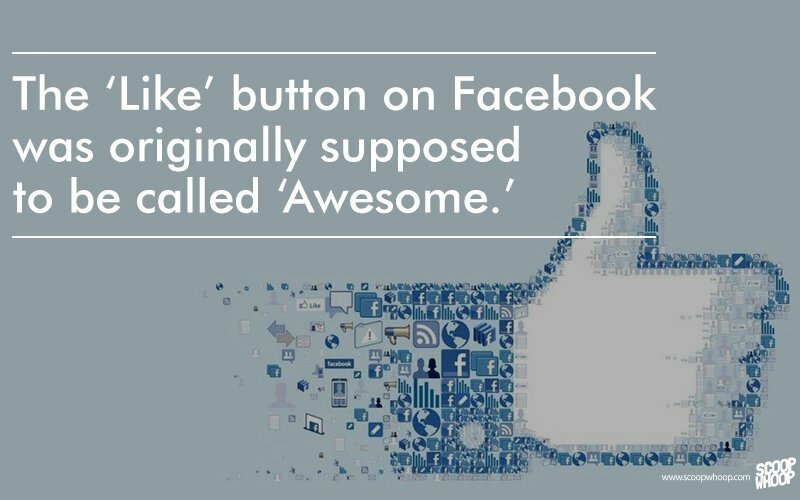 The Like button that you see daily on Facebook, was originally going to be called as AWSOME! Now that sounds scary. 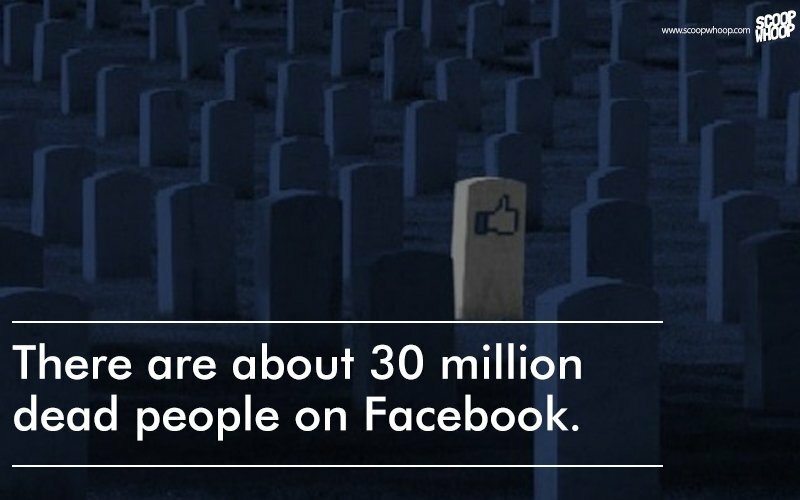 There are about 30 million people dead on Facebook. Who takes the effort to delete the account of those who have passed away. If you take their wall, you can see a lot of RIP’s on their timeline. This person’s face was the first ever face in Facebook. Facebook’s front page used to feature this person’s face partly obscured behind a cloud of binary code. 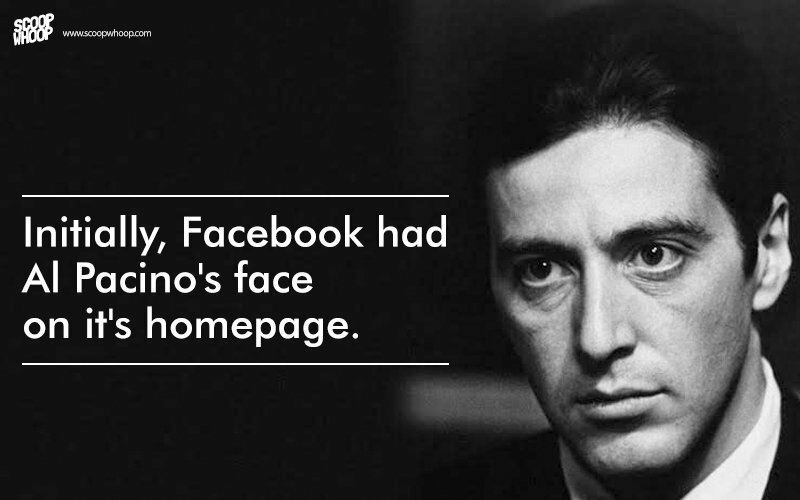 Known as the “Facebook guy,” it was not known who the mystery man was until recently, David Kirkpatrick revealed in his book The Facebook Effect that the image is a manipulated photo of Al Pacino created by a friend and classmate of Mark Zuckerberg. How many of you noted that? Don’t worry it was as surprising for me too. 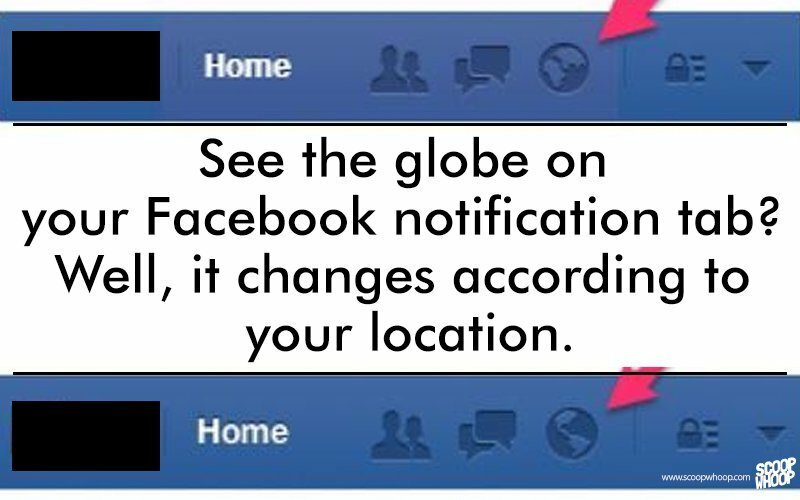 The Globe on your Facebook notification tab will change according to your location. Now go check! 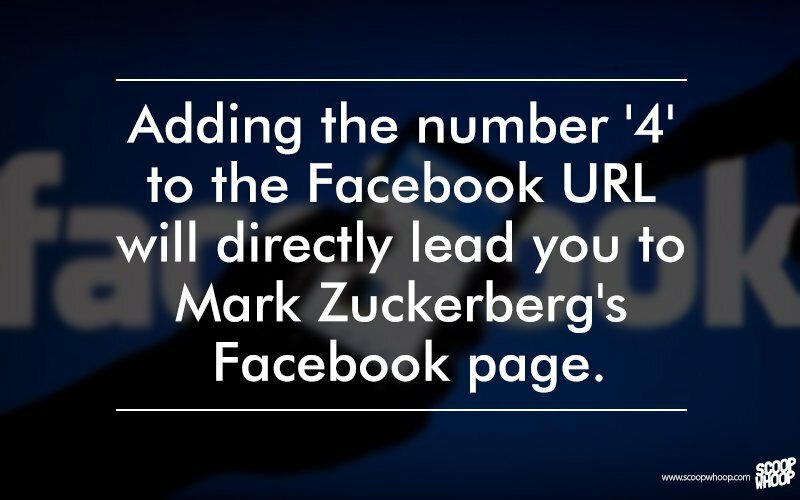 Have you ever tried adding the number 4 to the Facebook URL. It looks something like this – www.facebook.com/4 and it directly takes you to Mark Zuckerberg’s Facebook page. Of course, he needs certain privileges as he is the CEO! Its time to choose our Heir! We never know when we are gonna die. And Facebook is our possession with whom we spend most of our time on. So Facebook gave us an option to decide what happens to our Facebook account when we die. Who other than Facebook can be so generous to give us an option like that! The only thing unpredictable and uncountable is the number of new Facebook profiles being generated. Since day by day and minute by minute the number of profiles are increasing dramatically, it is impossible to state about the accurate number of Facebook profiles and Facebook pages. 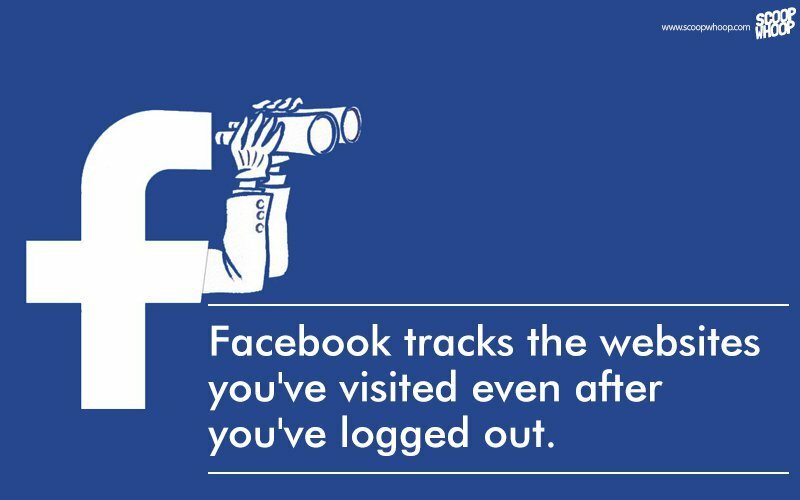 Do you wonder, even though you spend most of your time on Facebook, you really didn’t know anything about it? I mean apart from the name of the founder, that is. These were the some of the fascinating facts about the world’s favorite social networking website and I hope you were truly amazed. Liked the article? Please leave your comments!